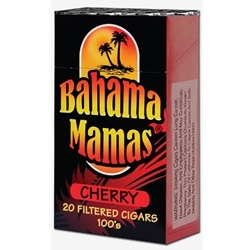 Bahama Mamas Cherry Filtered Cigars are available in Box 100's and packaged 20 cigars per pack, 10 packs to a carton for a total of 200 premium filtered cigars. When you're short on time, but crave a smoke that's jammin' with flavor, reach for a Bahama Mamas Filtered Cigar. Made with a similar blend of flavors like the original Havana Honeys line. Each of these flavored cigars with a natural wrapper are offered here at Smokers Discounts. Call our customer service for more details.